Gluing plywood structures together with epoxy fillets saves considerable time constructing the joints and reduces overall weight of the structure compared to more traditional methods using wooden cleats and screws. The strength and gap-filling qualities of epoxy eliminate the need for precisely fitted wood cleats that otherwise require time and skill to create. 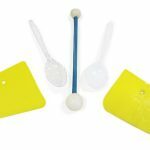 When gluing with conventional adhesives, that are non-gap filling such as resorcinol glue, wood cleats need to be well fitted, need to be wide enough to provide sufficient glued surface area and provide enough thickness for screws to be driven into. Building with epoxy fillets is especially beneficial when attaching bulkheads to hull sides, attaching hull sides to hull bottoms where the faces of the plywood are coming together at ever-changing angles. 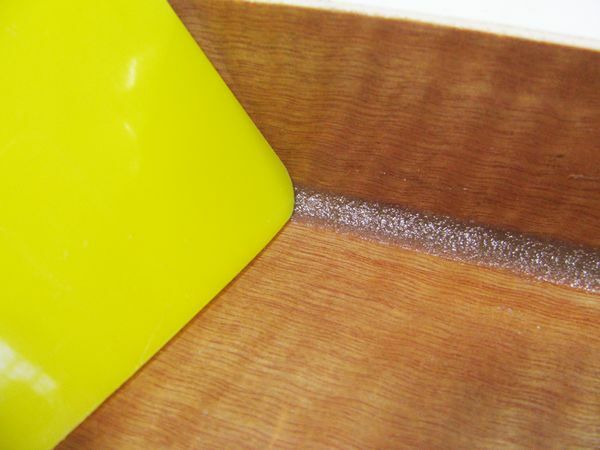 Because epoxy can be thickened with high-density fillers into a non-slumping consistency it can bridge large gaps in wood joints, without loss of strength, thus saving a great deal of time labor otherwise needed to create a strong joint. 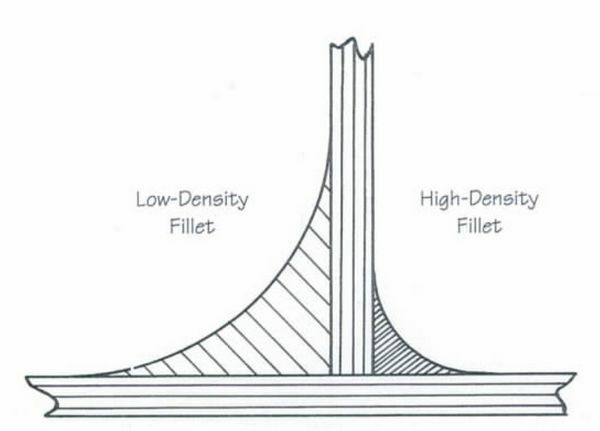 Cross section of low-density and high-density fillets. 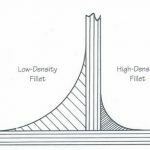 Low-density fillets require a much larger radius than high-density fillets to make joints of the same strength. 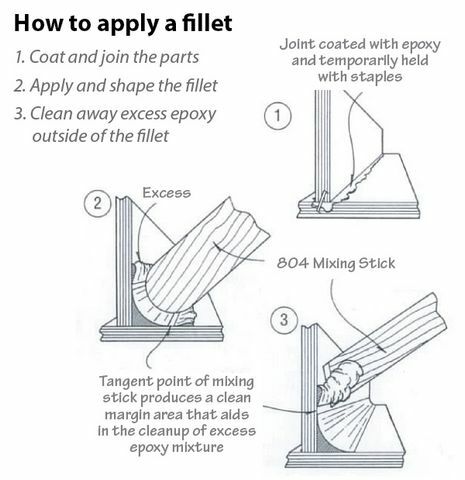 How to apply a fillet: 1. coat and join the parts. 2. 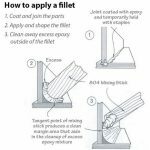 Apply and shape the fillet. 3. clean away excess epoxy outside the fillet. Fillets are also used when gluing stringers and frames into hulls. In these applications, fiberglass fabric (called tabbing) is often applied over the fillet that extends and onto the hull and stringer 2-3” to reinforce the joint. Smooth rounded fillets bridge the hard corner and give the fiberglass reinforcement something to be attached to. 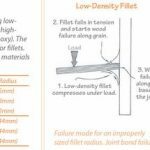 Without the fillet, fiberglass fabric won’t go into a square corner well, and the strength would be decreased. A wide variety of objects can be used to make fillets. 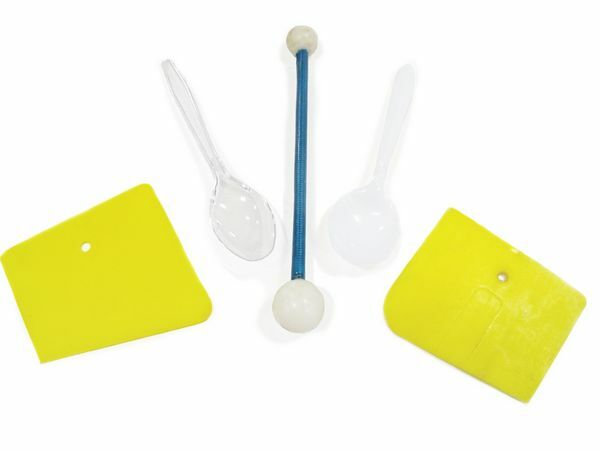 Plastic spoons and rounded off 808 Plastic Spreaders can be particularly useful. When hull interiors are to be finished natural, epoxy fillets are often colored with a blend of thickeners to achieve colors that match the natural color of wood. One way to achieve a natural brown fillet would be to use our 405 Filleting Blend filler. It is a blend of dry powder fillers designed to produce medium brown thickened epoxy. You can also make your own color-matched fillets. 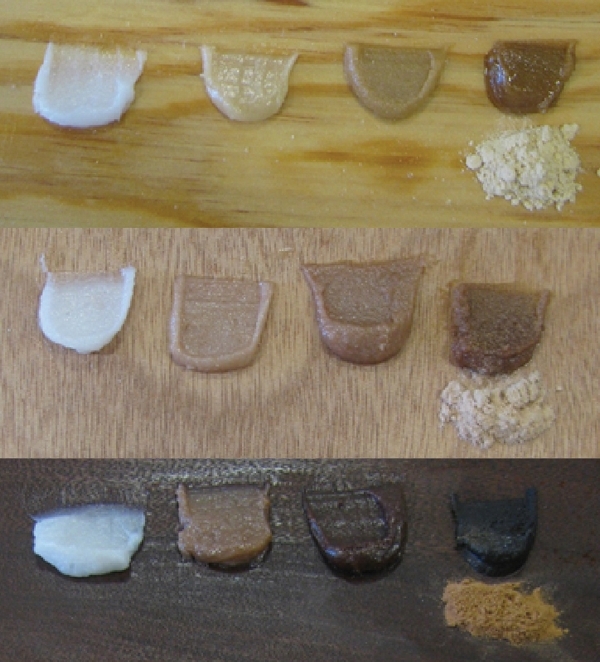 Some people use sanding dust, taken from their palm sander dust pickup bag after sanding the wood that they are trying to match. If you use sanding dust exclusively however to thicken the epoxy, it will be grainy to work with and it will be significantly darker than the original wood that it was created from. A better approach is to initially thicken a batch of epoxy with 406 Colloidal Silica filler to a mayonnaise consistency (this will create a translucent white/smooth and creamy epoxy) then add wood sanding dust until you arrive at a color you are happy with. The translucent white color of the 406 filler is easily overcome by the wood sanding dust. Add a little wood sanding dust and you’ll get a colored epoxy that is lighter than the wood. Add a lot of the wood sanding dust to the 406 filler thickened epoxy mix and it will become dark. See the photos of three different wood types with four dollops of thickened epoxy on each. You will discover that if the 406 filler is used to thicken the epoxy alone it gives the mix a translucent white look that will nicely offset the darkening effect of wet wood flour (sanding dust) allowing you to arrive at a color that perfectly matches the wood tone. To do this well though, you will need to have a varnished wood surface or an epoxy-coated surface to see what the wood looks like as you try to color match the thickened epoxy for making fillets. What the epoxy looks like while uncured is what it will look like after it cures. So, if a natural wood finish is desired, you can add to the overall beauty and elegance of a glued plywood structure by using color-matched epoxy fillets. Three different wood types with four dollops of thickened epoxy on each. The first dollop (white on the far left of each) is thickened with all 406 Colloidal Silica filler. The second one is thickened with 406 filler and a bit of wood sanding dust. The third one is thickened with 406 filler then thickened with significantly more wood sanding dust. The fourth one is thickened with wood sanding dust exclusively and is by far the darkest of them all. The dry sanding dust of each wood type is set next to the last thickened epoxy dollop.